On Saturday, February 24, 2018 approximately 1,063 pieces of high school artwork were judged at the Region 16 Visual Art Scholastic Event, VASE. 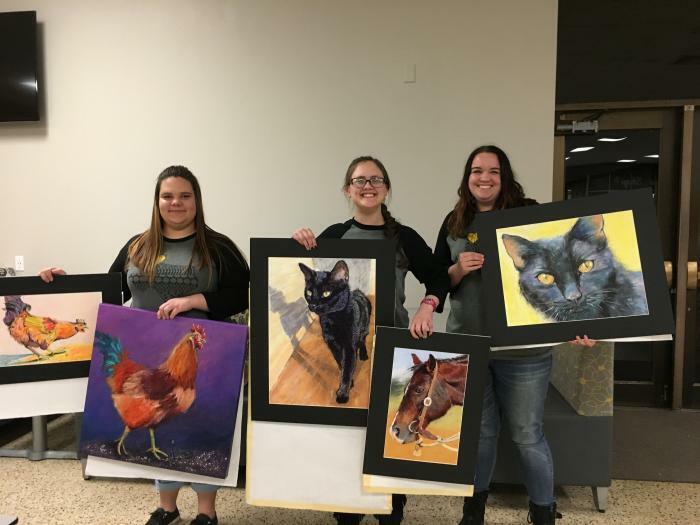 Students and teachers from all over the Texas Panhandle came to Amarillo High School for this annual event sponsored by the Texas Art Education Association. VASE is a UIL equivalent contest much like TMEA All-State Music. The students may enter one or two pieces of original artwork that they prepare for the contest by matting and composing a written response to six statements. At the event, students meet with a qualified judge where they will be interviewed on their concept and artistic decisions. The judge then rates the artwork and the student’s artistic knowledge and content according to TAEA standards. Students receiving the highest rating will be awarded regional medals and their work will be judged again in the Area Contest at the conclusion of the regional judging. Area winners will also receive an area medal and their work will go on to compete at the State Visual Arts Scholastic Event on April 27-28, 2018 at San Marcus High School in San Marcus, TX. This is an exciting and valuable educational experience for high school art students throughout the Panhandle. 9 out of 10 of these students received a Rating 4 on both works of art they entered, which is the best rating you can get. From the 4 rated entries three Kelton ISD students are advancing on to State VASE. The students that didn't go to state Mrs. Harless is also very proud of because they were just as much apart of the competition as the rest and handled it well. Medals are awarded to those students receiving a Superior (Rating 4) rating in each division at the regional event and medallions are awarded to those students receiving a Superior (Rating 4) rating at the state event. They are among the top 10% in the whole state of Texas going to State. These three students are advancing to STATE VASE in San Marcus, Texas on April 27-28 2018.